Earthquake Valves Memphis TN | Brown Refrigeration Inc. Explosions can cause some of the most extensive damage during earthquakes. The explosion and resulting fire from broken natural gas lines and be devastaing to your property. Protect your home or business' heating and cooling system with the installation of an earthquake shut-off valve. In the event of an earthquake beyond a predefined threshold, the value will automatically shut off the gas supply to prevent further fire danger. 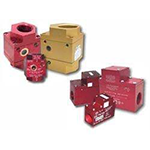 Brown Refrigeration, Inc. offers earthquake valves. Please contact us for more information.